The Unauthorized Non-Cook, also known as the Unlicensed Non-Cook and the Unapproved Non-Cook, is barred from cooking, usually by a partner or spouse, who is almost always a cook. The injunction against the non-cook cooking may be made sometimes, frequently, or all the time. Reasons for the prohibition against the Unauthorized Non-Cook cooking include attempting to avoid sullen resentment and/or fits of non-confidence that result (on the part of the non-cook). Not to mention the inedible food. Other common reasons for the bar include the non-meeting of various standards (safety, nutritional, hygienic, etc). Bottom line: The unauthorized Non-Cook is not supposed to get in the cook's way, as in "Stay out of my kitchen, You." Note: The terms Unauthorized Non-Cook, Unlicensed Non-Cook, and Unapproved Non-Cook were coined by sculptor Hiroyuki Hamada, the beloved spouse of a non-cook of various descriptions, including those. 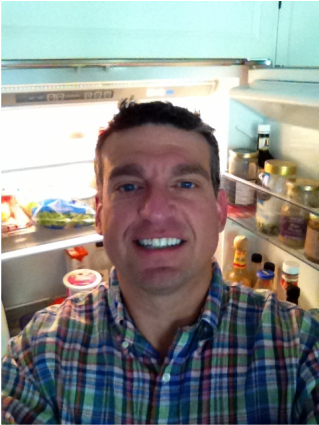 "Here is a picture in front of the fridge. I go there regularly. Leftovers and the cooking from the real cook are ok to eat. If I pull out raw ingredients, I get the look!" "I would cook, I may even like to cook, however I am banned from cooking. My wife is a great cook. The kitchen is her domain and off limits to me for general use. I do not live up to her standards of hygiene. She has invited our younger daughter into the domain and she bakes. I learned this is different from cooking. Baking is its own thing. Our older daughter has recently attempted to cook. There were rules to be learned. Her first attempt at cooking was a bit too aggressive – eggplant parm. It didn’t turn out. She shows some signs of maintaining the proper level of hygiene to be invited into the club – but barely so -- she takes after me. I do get to grill because it is outside. That is a different thing, too -- like baking, but outdoors."